These three months are quiet times in the gardening calender and indeed when it comes to caring for your lawn. The thing you can be doing is clearing your lawn of leaves. 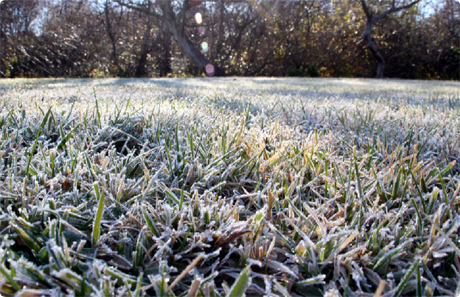 A thick layer of rotting, damp leaves can potentially discolour and repress grass. If the lawn becomes frozen or waterlogged try and avoid walking over it. It is also a good time to check your lawn mower and maybe think about popping it in for a service. If the weather permits you can make your first cut. Remember to set your mower blades high, cutting too short may damage the grass. With the arrival of Spring comes along the start the lawn care season. Feed the lawn mid spring with an application of Spring lawn feed. If you have a moss problem, now is a great time to try and irradiate it. See our "How to Treat Moss" page. Regular, gentle cuts will encourage the lusciousness of the grass and help prevent weeds. Trim the edges of of paths and borders to keep your lawn smart looking. The warmer day's are here so the lawn care is upped slightly. Mowing should be at regular cutting height now once or even twice a week as grass grows at it's fastest rate now. Click here for more information on "Grass Cutting Heights". Trim lawn edges to keep them looking neat. Remove all grass clippings from the lawn or this will discolour and sometimes even kill off the grass that lies beneath. In terms of watering, a good soaking a few times if better than lots of smaller, lighter watering's. If you still have some persistent weeds you can now use a 'spot' treatment or pull out the touch little things with a hand held weeder. We like this Wilkinson version. Now is the time to run repairs on your garden so if you have any holes or bald patches you can be filling these with topsoil, raking over bald areas and either re-turfing or re-seeding. The weather normally in Autumn is warm and fairly moist which is great for growing and grass seed germination. Autumn is a great time to prepare any new lawn area, again the weather conditions this time of year should be perfect for the job. You should be thinking of mowing your grass for the last time now, make sure your last cut is a light mow, taking of the tops of the blades. You can purchase Autumn lawn feeds if you wish to give your lawn an extra treat. Rake out thatch from turf and continue to rake up leaves. Spike the lawn to assist with drainage. Brush in peat and sharp sand. Other than those few things; Winter is an easy time on the lawn front, so take it easy, enjoy the festive season and remember to keep off grass if damp and frozen.